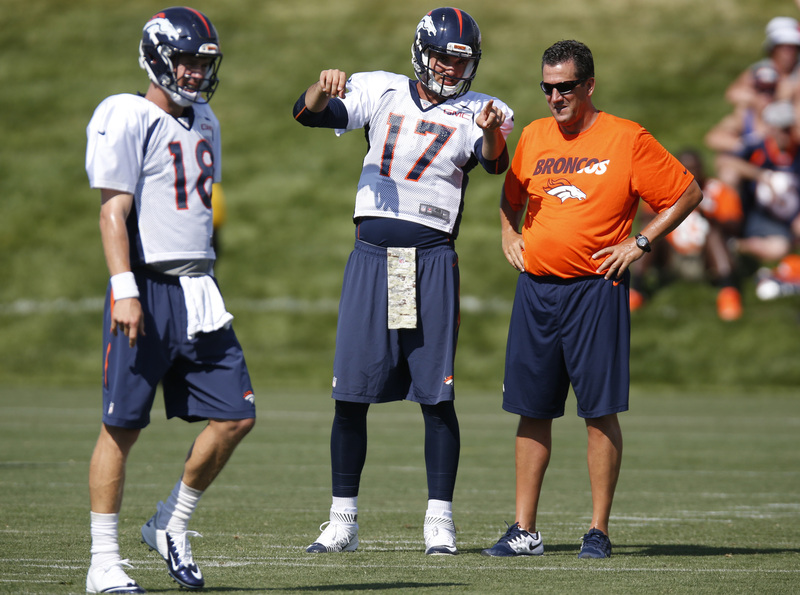 Denver Broncos training camp: Brock Osweiler, QB of the future? Published: Aug. 4, 2015 at 11:54 a.m. Updated: Aug. 4, 2015 at 08:06 p.m. The road to success in the NFL begins each year with the hard work and wide-open possibilities of training camp. As teams around the league gear up for the 2015 campaign, NFL Media reporters will be checking in from all 32 camps around the league. For our next stop, Ian Rapoport visits the Denver Broncos. At one of the NFL's more scenic home venues. The Broncos hold training camp right outside their Dove Valley headquarters. With overflowing fans chillin' on the grass hills next to a newly erected indoor facility, the practice fields have a nifty amphitheater feel. 1) On the day I visited, starting quarterback Peyton Manning played the role of cheerleading quarterback Peyton Manning. He watched without pads as his backup, Brock Osweiler, acted out the role of the starter. It's a device new coach Gary Kubiak is using to keep the aging Manning fresh, but it's also a device the organization is using to evaluate if Osweiler (in the final year of his rookie deal) is the true heir apparent under center. Not taking every practice snap is clearly something foreign and odd to Manning, but under the new regime, the focus is on the future, in addition to the present. 2) The further we get from the end of the 2014 season, the more sense the move from John Fox to Kubiak makes. Turns out, it was the ugly 22-7 loss to the Rams in Week 11 -- a setback in which Denver was plainly pushed around -- that opened the organization's eyes to needing more intensity and urgency. Fox was universally respected in the organization for years as the perfect coach to turn the Broncos around, but had he taken them as far as he could? Broncos brass hope Kubiak takes Denver to the next level. Already, the Broncos like his sense of purpose and energy at practice. He's involved in, it seems, every drill during workouts. 3) Throughout his career, Kubiak and his coaching staff have taken unknown offensive linemen and made them functional quickly. He'll need to do it again, thanks in part to the season-ending knee injury to left tackle Ryan Clady. Can rookie Ty Sambrailo step in and protect Manning right away? How well this line plays will determine if the quarterback is healthy and stepping into his throws in December. Many of Denver's woes in 2014 can be traced back to Manning's poor health and an offensive line that was an undercover weak link. Shane Ray, OLB: A player as talented as Ray never should've been available to the Broncos at No. 23. But an off-the-field incident and a nagging injury made it happen. What Denver ended up with is a successor to DeMarcus Ware who will give defensive coordinator Wade Phillips a fun option off the edge to feature and agitate opposing quarterbacks. And by the way, that toe injury hasn't been an issue. Ty Sambrailo, OT: Denver grabbing Sambrailo in the second round might have been one of the most fortuitous picks in recent years. No one could've foreseen another season-ending injury for Clady in late May, but this Colorado State product at least gives the Broncos a highly regarded option to replace the Pro Bowler. The rookie will have to learn quickly, but coaches agree that having the injury happen so early in the calendar will likely assist Sambrailo in the long run. "I know it's hard on him, and we all know that, but I think he understands why we're trying to do it." -- Gary Kubiak, Broncos coach, on the uber-preparatory Manning being forced to rest his body while his understudy, Osweiler, tries to prove his worth to the organization. » Demaryius Thomas was on the field while many of the other veterans sat on Monday, working his way back from an offseason of contract uncertainty (that ended with a five-year, $70 million contract). Manning's pay cut is long in the books. And with Von Miller extension talks coming next offseason -- not this preseason -- the Broncos have handled their business. With the second-smallest amount of dead money in the NFL, all eyes and money are on the field. » Yes, Miller is in a contract year, and he appears primed and ready to produce at a very high level. He'll benefit from Phillips' creativity when it comes to manufacturing havoc. » Denver thrives when it has four legit options on offense, but will a key one be 2014 second-round receiver Cody Latimer? Opportunity is there.